Planets about to Change signs and Specially those in Gandantha , Fallen and going in Retrogression and Stationary are most Venomous at the time of any Event as per Prashna Jyotish. At the time of the BJP Going in the Court Jupiter, Mercury and Rahu will be instrumental for the Verdict By the Court on the 23rd April 2019 and may put Rahul Gandhi in Hot Waters for his Remark. The Supreme Court has issued a notice to Congress president Rahul Gandhi in connection with a contempt petition filed against him by the Bharatiya Janata Party on the Rafale controversy. The BJP had filed a petition in the Supreme Court on Friday after the Congress president hit out at Prime Minister Narendra Modi at a rally with chowkidar chor hai remark. After the Supreme Court announced its decision to allow leaked Rafale documents to review a previous judgment, Congress chief Rahul Gandhi had claimed a moral victory and said the court has made it clear that Prime Minister Narendra Modi “committed theft”. Following this, the BJP filed a contempt plea against Gandhi for calling the Prime Minister a chor’. 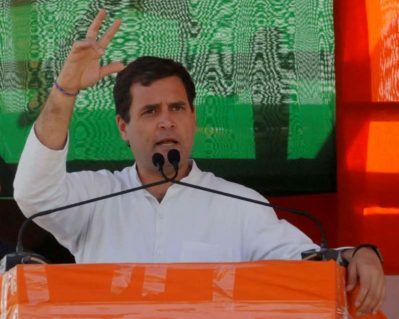 The BJP accused Rahul Gandhi of contempt of court and seeking action against him for levelling unsubstantiated charges against Prime Minister Narendra Modi over the Rafale deal. BJP MP Meenakshi Lekhi had filed the criminal contempt petition in the Supreme Court against Rahul Gandhi and pleaded that the Congress president had deliberately misinterpreted the court’s recent order in the Rafale deal. The Supreme Court has asked Rahul Gandhi to submit his response by Monday (April 22). The next hearing is on April 23. A BJP delegation, including defence minister Nirmala Sitharaman, also approached the Election Commission demanding action against Rahul Gandhi over his remark against Modi on Rafale deal. The Congress president is using abusive words against the Prime Minister that are untrue. He is repeatedly calling the Prime Minister a chor’ by putting words in the mouth of the Supreme Court, Sitharaman said. 3. Moon in Rahu Nakshatra and Rahu about to becomeDirect is most malefic Parameter on the 11th April 2019 when the BJP went in the Court. 4. Rahul Gandhi Dasha ofRahu-Rahu to start on the 15th April 2019 and Transit Rahu over the Natal Sun and Mars in transit is also most malefic Parameter for him to put him in hotwaters . 6. AsSaturn is nearing the Retrogression Mark on the 30th April and Both Saturn and Jupiter will be in Stationary Position will be Most Malefic for him since on the Natal Moon who is also the 10th Lord of his chart .